The waves sparkled in the sunlight, mocking Jordan’s feeble attempts at swimming. An albatross circled overhead, remote and untouchable in the vast blue desert that was the sky. The rain had fallen in sheets, destroying visibility and making it impossible to work on deck. The boat had turned broadside to the waves, and the horrible tearing sound of the vessel ripping apart, punctuated with cries of alarm from his crewmates, had all been swallowed by the fury of the raging wind and rain. Since the storm cleared, not a single drop had fallen. For almost two days. Jordan was afloat, although he was beginning to believe everyone else had met a more merciful end. He dipped his head to splash some water on his cracked lips, wincing as the salt stung them. It didn’t help. Nothing helped. His self-inflating vest had saved his life, but if he was smart, he’d take it off and end the burning thirst. He’d never been smart. He’d tried looking for fish—hell, he was hungry enough to eat a raw seagull—but nothing came within reach. The bright sun reflected back at him from the lapping waves, making his eyes throb in sympathy with his lips. Still, if he quit looking for food, he might as well lose the vest. He scanned the endless expanse of surrounding ocean, wincing at the reflected light. It was particularly bright to the left. He closed his eyes, but the thought hammered at him. It was brighter. Something was different there. He dug into the water, desperation lending him the strength for a few sure strokes. His hand closed around something round and hard. He brought it up to his face and shook his head. A fishing float—a glass one. They were a rarity now that everyone had switched over to plastic. On any other day, he’d be excited. Today it was another failed hope. She sounded like a child for all that she had a woman’s breasts. Usually that would command his complete attention, but right now he’d gladly trade the sight for a glass of water. Jordan forced his voice to work. “What’s it worth to you? Can you take me back to land?” She must have a boat out here somewhere, although it couldn’t be bigger than a kayak. He didn’t care if it was an inner tube, as long as she had something to drink. “Fine,” she snapped. I will!” She dove and a silvery tail splashed. Jordan squeezed his eyes shut and rubbed them. Now he was seeing mermaids. He was hallucinating. But he hung onto the float anyway. The Coast Guard might still come, with their big, beautiful boats equipped with many bottles of water. Then he could show everyone the float when he told them the tale. It would make a great fishing story, even though their catch was feeding crabs at the bottom of the sea by now. He sighed–the captain was there, too. And Jim and Steve. And if he didn’t get some water soon, he’d be joining them. He drifted, unable to fight it any longer. But he didn’t unfasten the vest, and he didn’t let go of the float. That was enough to raise the ghost of a smile. “I don’t think so. Take me to where I can at least see land.” As long as it was his hallucination, he wasn’t going to be a fool. Crazy was bad enough. She swam off again and Jordan’s head dropped. She was annoying, but at least she was something to think about besides his dry mouth and burning lips. His head was shoved over, and Jordan looked up, sputtering. Right at a smiling dolphin. “Well, what are you waiting for? Grab his dorsal fin.” The girl gestured from the other side of the dolphin. Jordan tucked the float into his vest and tentatively reached for the dolphin. It didn’t back away, but instead it tolerated his touch. It even allowed him to clamber up clumsily to lay across its back. Jordan held on with everything he had left. It was a glorious experience, even in his present condition. He was riding a dolphin. It was almost as hard to believe as a mermaid. But the feel of the dolphin surging beneath him was real. The wake of their passage was real. This was happening. And then he lost his grip and slid off. “I do,” Jordan said. “It’s just…I’m weak. I’ll keep trying.” He reached toward the circling fin and the girl gasped. And then the dolphin leaped up in front of him. Other dolphins were leaping, ramming into what he now saw was a mako shark. Jordan searched his pockets, but his knife hadn’t made it. The shark surfaced and made a beeline for them. Adrenaline gave Jordan the energy to shove the girl behind him. He smashed the float on the shark’s nose. It recoiled back, and that was enough room for a dolphin to crash into it, pushing it further away. Three others joined in and Jordan waited, panting, to see if it would be enough. “Ten balls.” Her tail made a little splash. She swam off, and Jordan really hoped it was to bring the dolphins back. He drifted in and out of consciousness but finally woke with a start to see two smiling dolphin faces in front of him. They swam to a cove with a stream emptying into it on the right, framed by evergreens. Jordan splashed and staggered his way in. His arms and legs felt like lead weights, far too heavy to move. He finished coming ashore at a crawl and sat in the middle of the stream, gulping water with reckless abandon. The first thing Jordan did after he finished with the Coast Guard was to hitch a ride to Newport. There he bought five glass floats—yellow, orange, red, green, and blue. He took them back to the beach and waited all night, but Anenome never showed. He buried them by the stone where she’d sat. When he checked again a month later, they were gone. Magical, imaginative and taps into a great vein of folklore in a unique way. A magical tale – such great detail. I felt I was there with Jordan, getting thirstier and weaker. 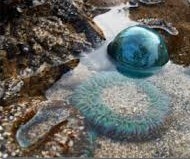 I’m so glad he kept his promise and brought Anenome the five glass balls. Too often, these kinds of stories end with betrayal. Oh, I love this story so much. I adore tales about sea people and this one was wonderful, a shame that he never saw her again, or does he? Thanks, Sharon and adele. I definitely wanted Jordan to keep his promise, and it needed to cost him something, in this case, his last hundred bucks. And no, he never saw her again. It wouldn’t be safe for Anenome. It was a singular encounter with Faerie. I wanted to communicate the bittersweet feeling that comes with the end of a pivotal, unrepeatable experience. It was beautiful–and it’s gone forever. Very nice use of float, I quite enjoyed this! I really enjoyed this mermaid tale! The line(s) “His self-inflating vest had saved his life, but if he was smart, he’d take it off and end the burning thirst. He’d never been smart” really struck home for me. Loved it not only for highlighting the only desperate way he has out, but also a touch of humor that helps show he still has fight in him 🙂 Very well done!